A unique approach to the Greek language, the Greek-English Lexicon by Louw-Nida is a great tool for advanced or intermediate Greek studies. Focusing on the contextual aspect of words, Louw-Nida uses categories called “semantic domains” to navigate the dictionary. With sections such as Plants, Animals, Festivals, and Status, words in this lexicon are arranged with like terms to easily distinguish between the similar Greek words in the category. 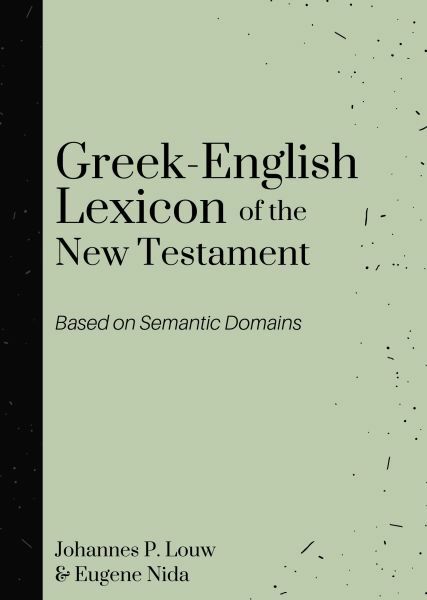 Not meant for single-word studies, the Louw-Nida Lexicon is helpful when studying topics and discovering all the terms the Greek New Testament uses to talk about a given subject. For example, if you are interested in the type of sea creatures mentioned in the Greek New Testament, you can look for the semantic domain: Animals and find a listing for all the “Fishes & Other Sea Creatures” mentioned in the Bible text. With full definitions for words and examples from the New Testament, Louw-Nida Greek Lexicon offers a different perspective to Greek translation.